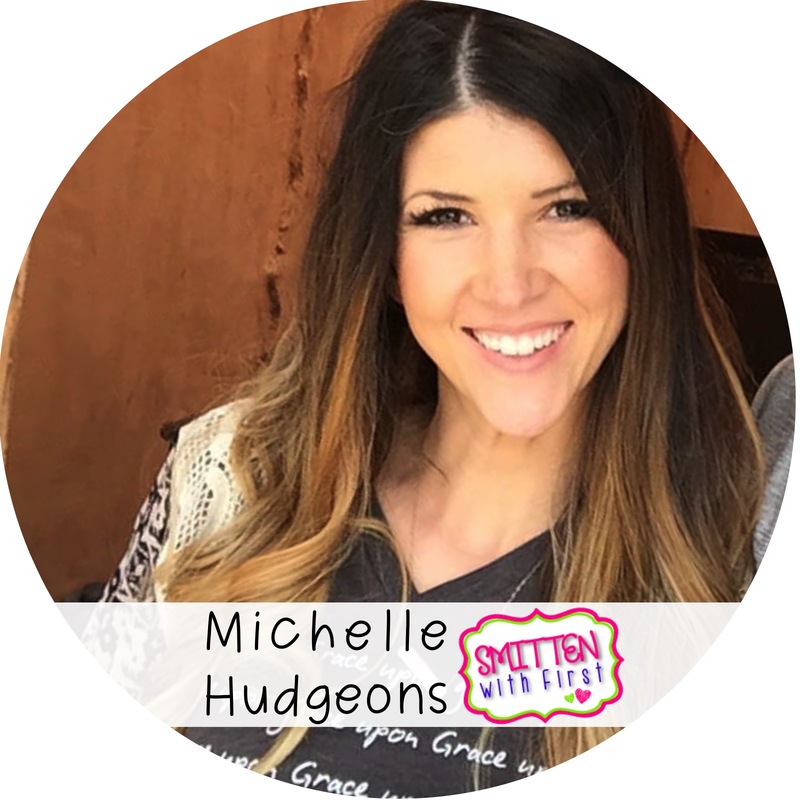 Hey y'all, it's Michelle Hudgeons from Smitten With First. 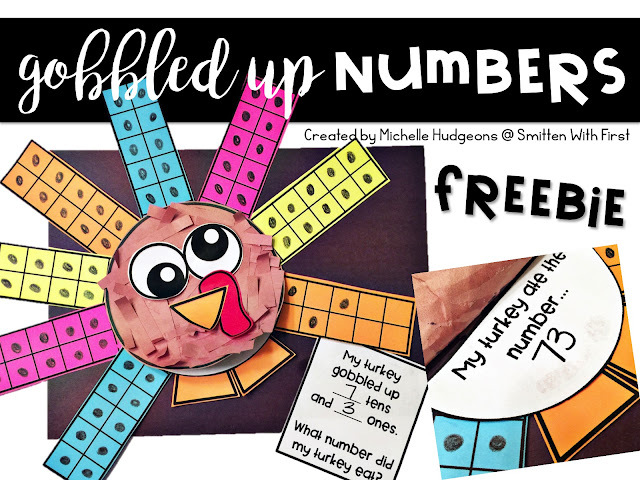 I wanted to share a quick math freebie with you all. 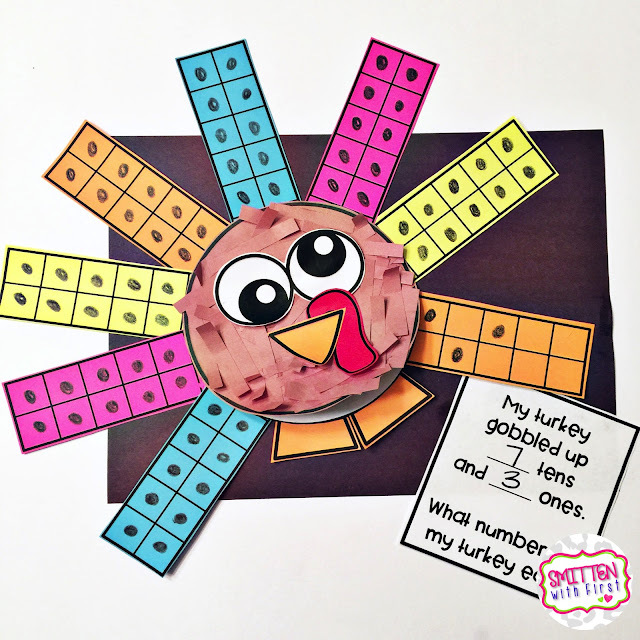 All you need is dice and construction paper! Let your students know that some very hungry turkeys are coming to your room today and they are going to gobble up numbers!!! 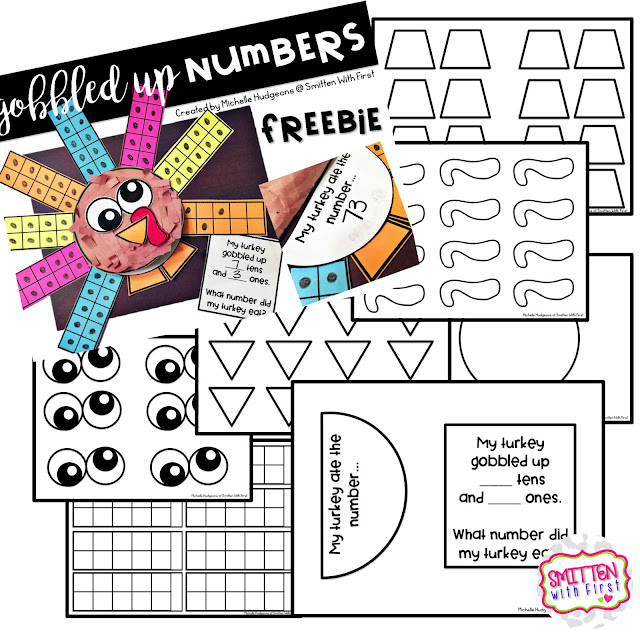 Give each student two dice and have them roll the dice to generate a number to build. The two dice will be their number for the tens place and ones place. 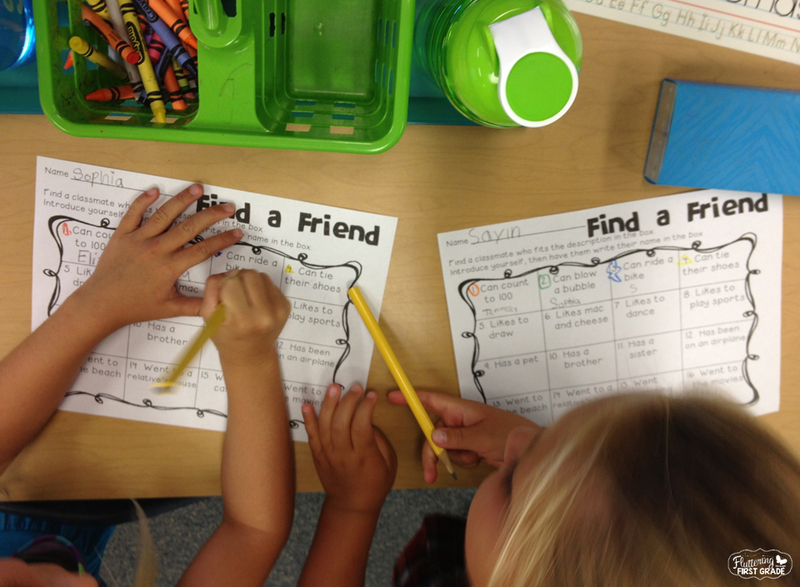 After students roll their number, they will color in their ten frames. The ten frames will become the turkey's feathers. After completing the ten frames and turkeys, students will record (on the recording sheet) how many tens and ones their turkey gobbled up! 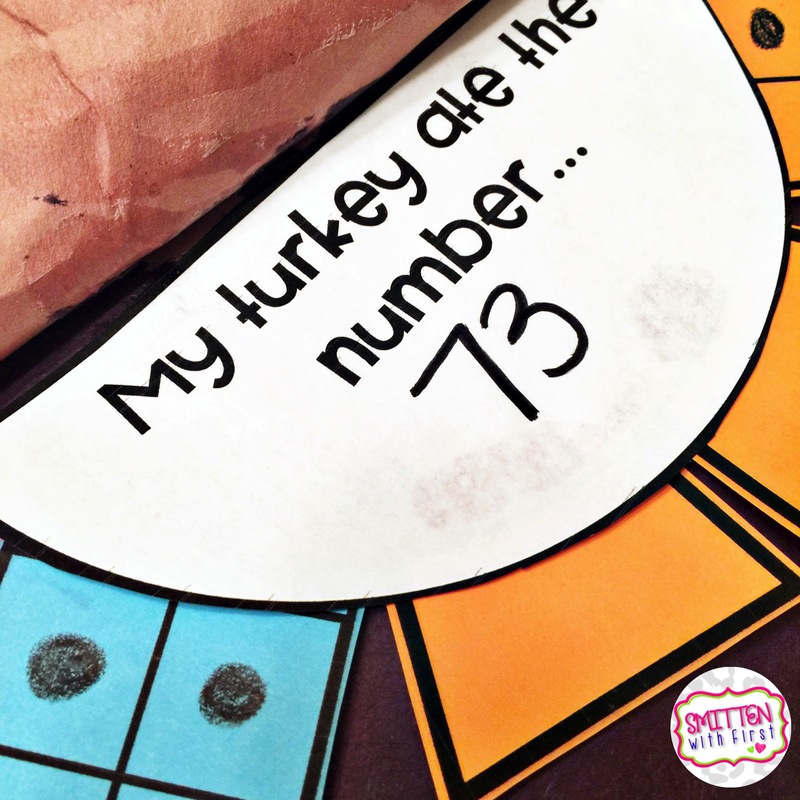 You can have your students go ahead and write the number that their turkey ate inside the turkey's belly, OR have your students trade turkeys with another student and have that student write what number the turkey ate. You can download this freebie here or by clicking on one of the pictures below. Did you join us all week on Instagram for Teacher Week?! Here's your chance to re-cap your week on the blog. One you've written your post, come back and link it up below! If you want to use any of these templates in your post, you can grab them HERE . Thanks so much for joining the fun all week!! We hope you found new friends to follow!!! Kicking Off Teacher Week 2016! Hi Y'all! 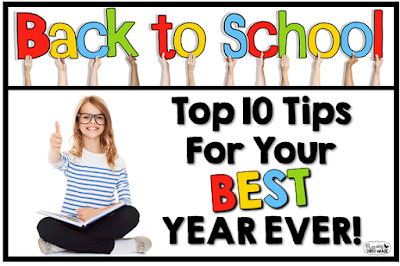 We hope you're starting the 2016-2017 school year off with a bang! 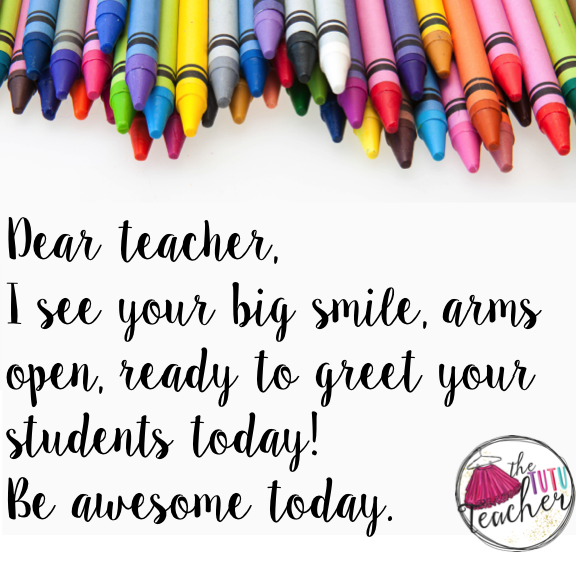 I'm Cheryl Saoud of Primary Graffiti and thrilled to post today announcing our annual Teacher Week. 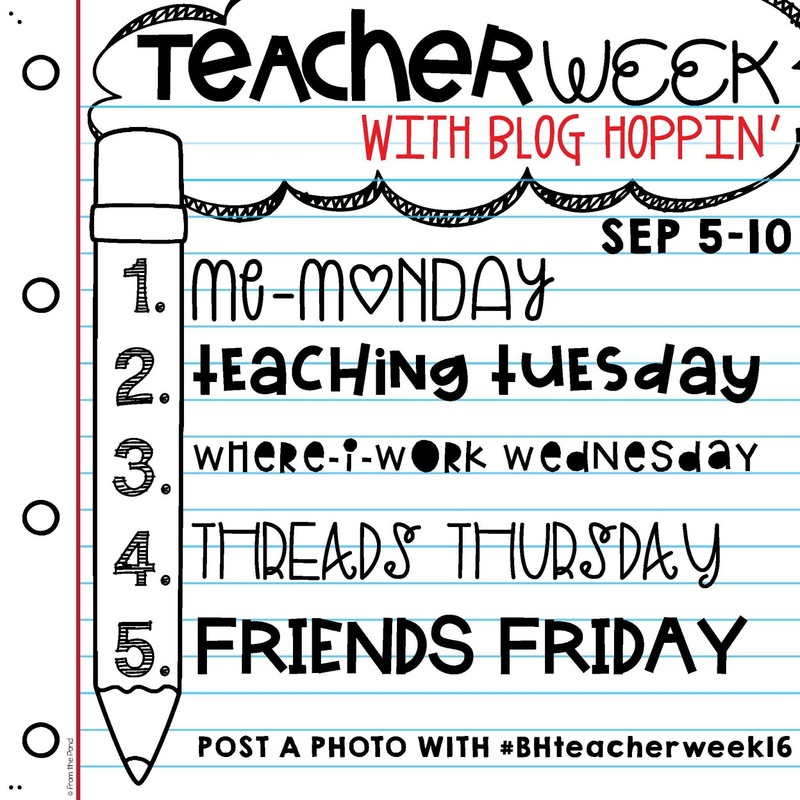 Since 2011, Blog Hoppin' has hosted Teacher Week as a way for you to share and gather fresh ideas from our collaborative bloggers and followers. 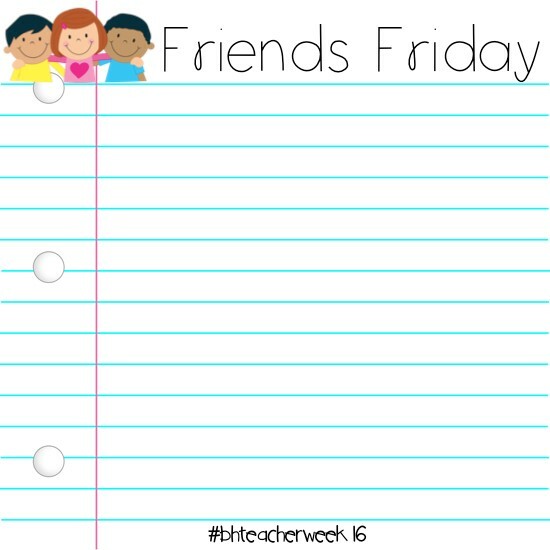 This year, we've decided to change the format of Teacher Week to accommodate for our crazy teacher lives! Starting on Monday September 5th, we ask you to join us on instagram with a picture and a caption each day. 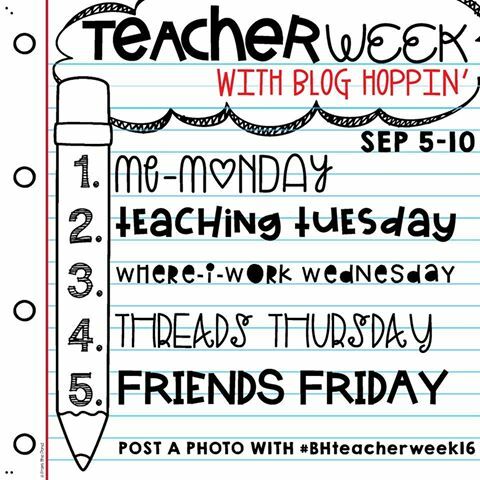 Please hashtag #bhteacherweek16 so that our Blog Hoppers and new followers see your daily post. On Friday September 9th, we encourage you to follow up with a blog post of your daily photos from the week. 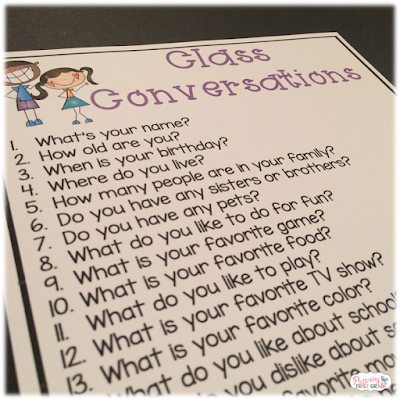 This is a great way to give a little more information about each of the topics without the added stress of a daily post. 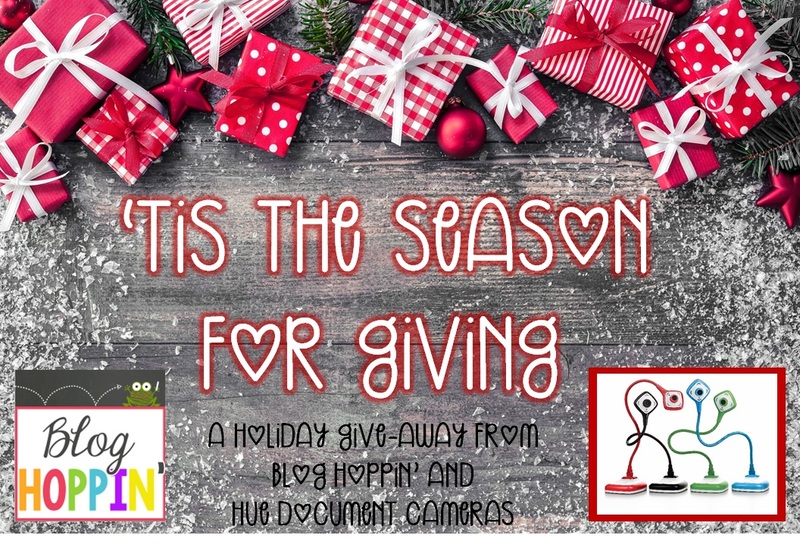 We will host a linky here on Blog Hoppin' so that you can hop around for new inspiration. 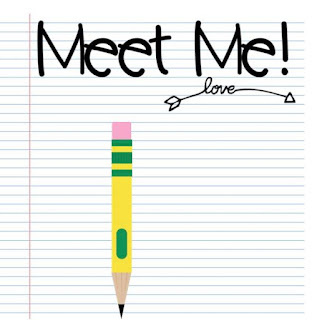 On Monday, teachers will share their introductions. We love get to know our friends and followers a little more intimately. 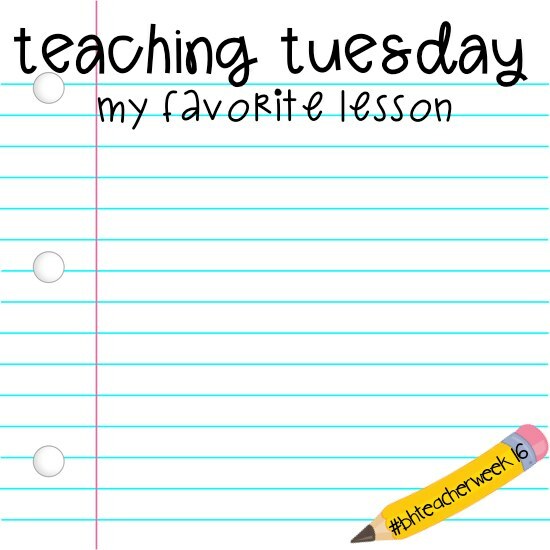 Tuesday you can show your favorite lesson of the year or a lesson from the week. Where I work Wednesday always fascinates me the most as we get to peek inside your classroom. Don't allow Thursday to scare you away. 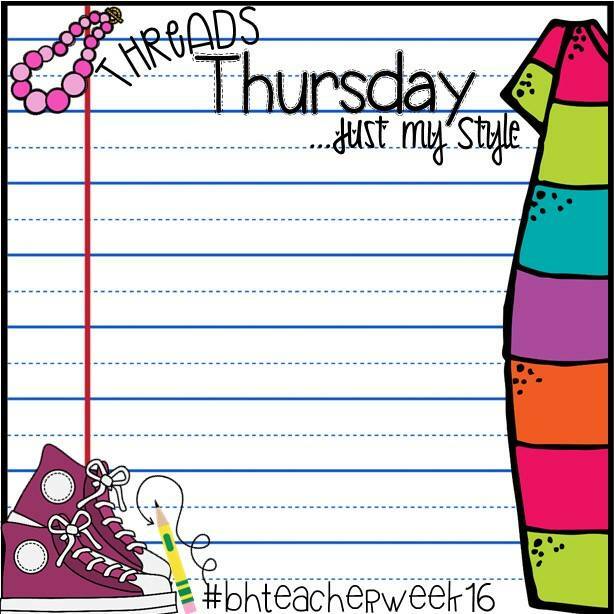 We will be posting an image of our teacher outfits. This can be a selfie wearing your favorite fit or displaying several of your go-to fashions. To finish off the week, introduce us to your friends. Okay friends, that sums up the expectations. We hope this format change helps to eliminate the stress of writing a daily post. We will be on the hunt for your photos using #bhteacherweek16. We wanted to provide some templates that you can use on Insta just in case you want to plan out your posts. You definitely do NOT have to use these!! You can just share a picture and tell us about it in your caption :)) BUT, here these are if you'd like to use them! Just right click to save and add your text/pictures on the image. Hey y'all! It's Michelle Hudgeons from Smitten With First! 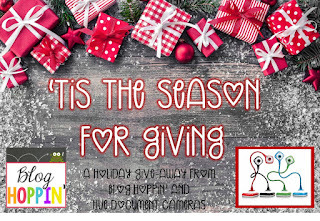 Incase you're anything like me and you're checking off last minute "to-dos" off your list, I have a cheap and cute teacher gift FREEBIE for you! This weekend while I was at Hobby Lobby, they had all their metal decor half off! Mmmhmmm, that's exactly what I said!!! I came across these small metal letters that happened to be $5.00 on sale! I couldn't pass them up. I grabbed letters for each of my daughter's teachers, my teammates, and our office staff! I may or may not have bought them out! Next, I grabbed a few Scholastic books I had left over from previous book orders, some burlap twine, and these tags for a quick, cheap, simple and cute teacher gift. Another idea: Buy a book from Half Price Books along with a gift card and attach it to the tin letter! Hello! It's Vera from The Tutu Teacher! 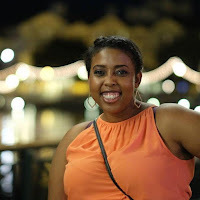 I wanted to share with you a post I wrote on my own blog. As we get ready to go back to school, meet our new students, plan with our peers, come home exhausted, tired, and worn out....we sometimes need to remember to lift each other up. Support each other. 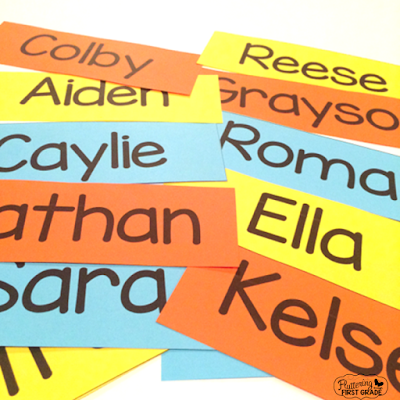 Check in with the new teacher down the hall and be sure she's/he's ok. Leave a nice note for a teacher on your team. Get yourself some ice cream or a new pair of shoes! It's time to go back to school. But if you're not, let me know how I can help. A few weeks ago, I was scrolling through Instagram and I stopped on a post by thekindergals about not being able to pour from an empty cup. Basically, we can't give to others what we don't have within ourselves and how important it is for us to take time for ourselves and recharge. Well, I just LOVED that message...and then I started reading the comments. I read a comment from one teacher who was experiencing an overwhelming school year. She said that when she goes on social media she was bombarded with images and messages that told her she needed to be happy. Always happy. Everyday. And she just felt horrible. And my heart hurt for her. Do I believe in being positive? I am a positive thinking person and I think that there is almost always a way to solve a problem. But at the same time, I think it's ok for people to feel overwhelmed. It's ok for us to feel like we have reached our limits and we need a break. It's ok to love the heck out of your weekends. Enjoy your time with your family and friends. And then, go to school recharged and enjoy your time with your kids because sometimes...many times... we are all they have. And the response was powerful. 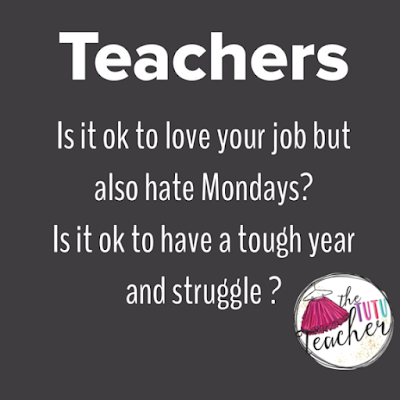 Teachers seemed to agree that yes, we can love our jobs, while loving our weekend and time away from the classroom. 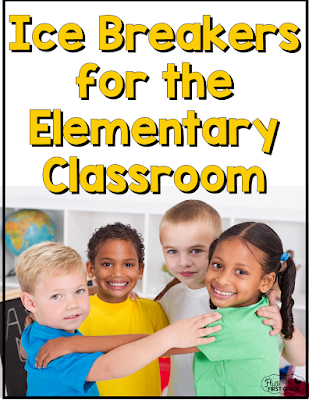 Teachers encouraged each other to take a break, make time for themselves, and be positive. What is this constant back and forth about? Why are there, Pro Monday and Pro Sunday posts? 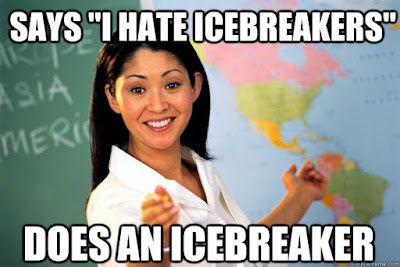 Why does it feel as if teachers who post about needing a break are shamed for their feelings? Why does it feel like people who love Mondays are constantly defending themselves? 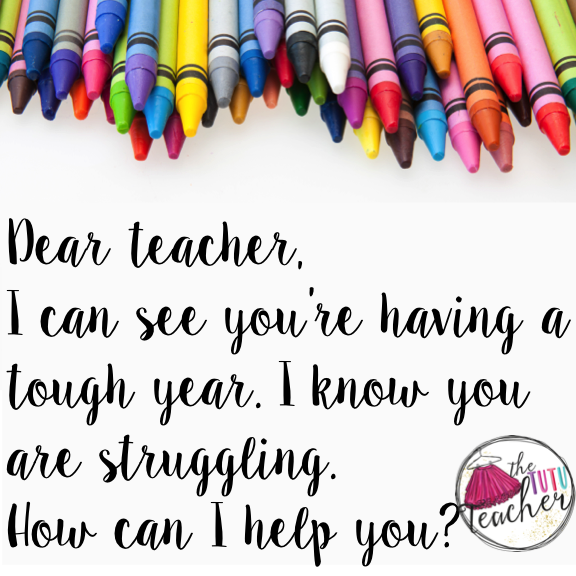 Why, at a time when teachers are overwhelmed by so many stressors (classroom, school, government), are we shaming each other? Why is the message of "Loving Monday" more powerful than "Enjoying Sunday"? I enjoy every moment of my weekend. I enjoy every moment of my time with my students. I am a good teacher. And I hope you will remember that. Remember it next Sunday when you're enjoying the remainders of the day with your family. Remember it Monday morning when you greet your students. Hey Peeps! Traci from Dragonflies in First here! 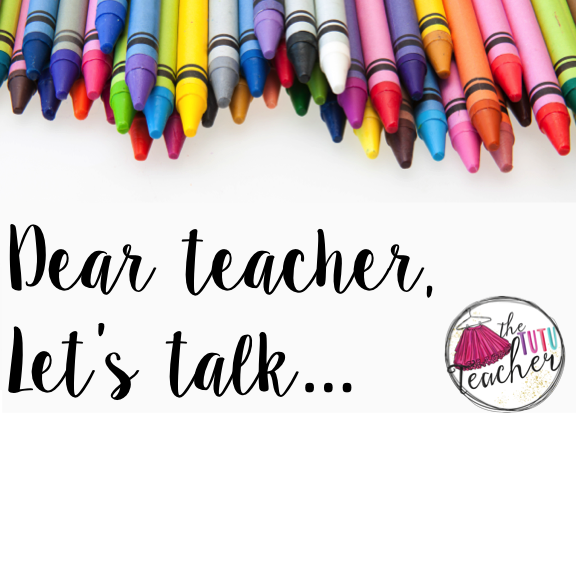 I wanted to share about something near and dear to my heart - Engaging and Meaningful classwork, which I've shared about a few times on my blog. It is essential to incorporate engagement strategies into your classroom throughout your day in order to ensure maximum student takeaway. Worksheets cannot replace brainstorming and discussion, field trips (both physical and cyber space driven), games, manipulatives, movement and role-play, music, story-telling and visualization opportunities. These key aspects of engagement are essential in every primary classroom. However, there are times when worksheets are simply part of the day. And that's ok! Just keep in mind, they should not be considered busy work. 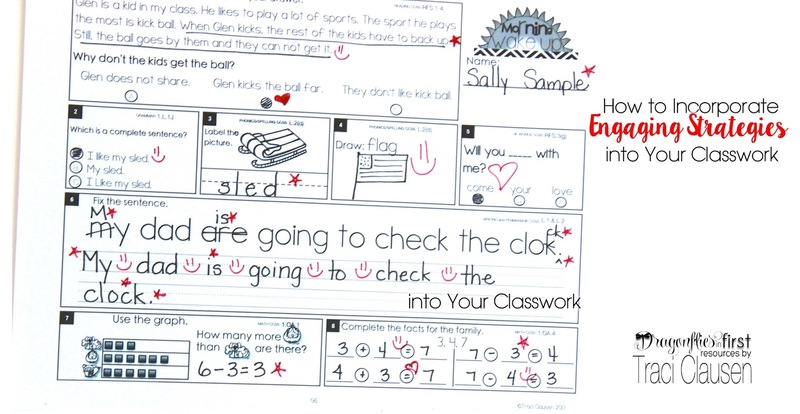 The worksheets you chose to incorporate need to have merit within themselves. 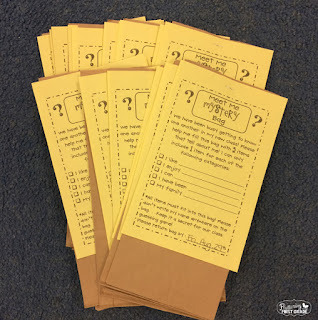 Can they be completed after/within partner or small group discussions? Are the part of delving into research? Are they true assessment opportunities that can guide instruction or provide vital progress monitoring data? 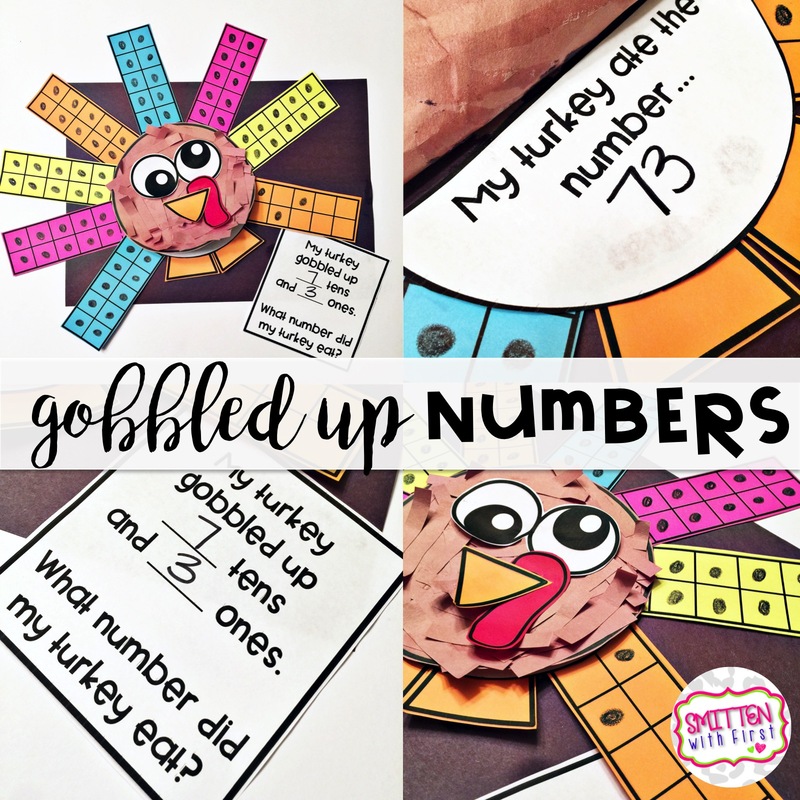 Worksheets have a bad rap in the minds of many teachers - and for good reason - when they are used for mindless busy work, very little is gained by the student and the teacher. They amount to a lot of wasted time. Throughout my many years of teaching one thing I have definitely learned - and it took a LOOOOOONNNNNNGGGGG time to learn this - was to s.l.o.w. d.o.w.n. I don't mean work slowly. 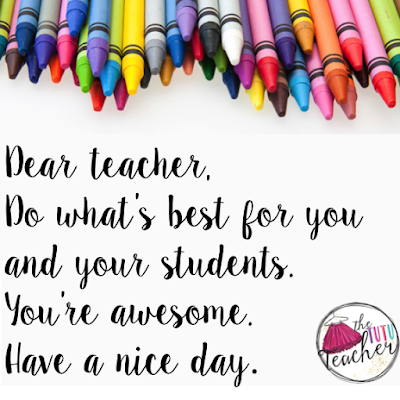 What I mean is - stop making the goal to get through your stack of work you scheduled for the day - but rather make everything meaningful, even the worksheets! Turn what is routine into something engaging and meaningful. This wasn't an easy shift in thinking. Like so many teachers, I am a task person. A list maker. I like to check things off, get things done and move on! But that is definitely NOT the way to teach. Thorough understanding doesn't occur that way. No, I don't mean throw out your schedule! That's just crazy talk!!! Just make room in it for better teaching. 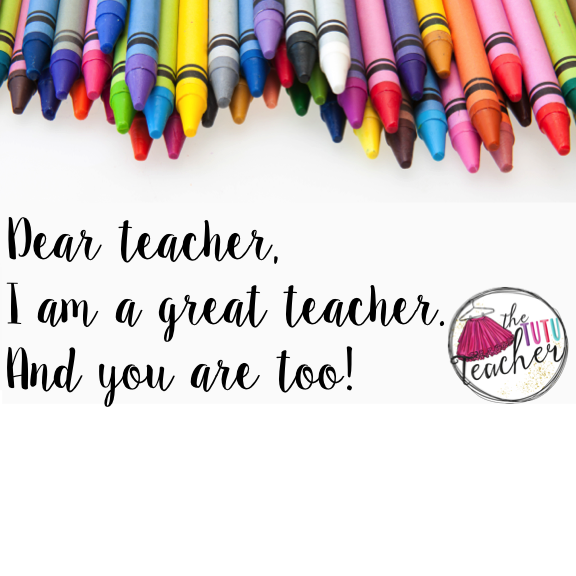 Giving myself permission (and sometimes simply forcing myself) to SLOW DOWN and wring every speck of learning out of each thing we do in class was a fabulous change for me. 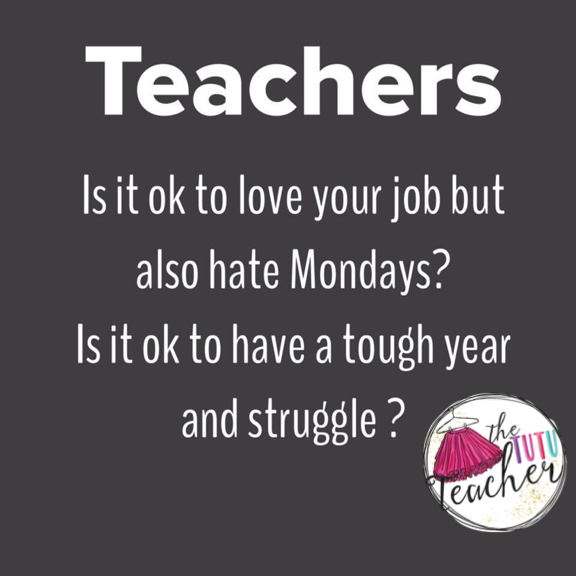 My first few years of teaching I always stressed about getting everything done and not "falling behind". One of the biggest and best "shifts" I made in this area was in correcting work. "Ok, grab your red pens and we'll go over this." In the first weeks of school we go over the rules about the red pens and how to grade/go over your own work. The kids know that skipping ahead, marking something correct when it is actually wrong and just needs to be fixed, will result in a moved tile and a paper that is thrown away. If they get something wrong, they know it is absolutely no big deal however it is a HUGE deal if they don't fix it when we go over it. 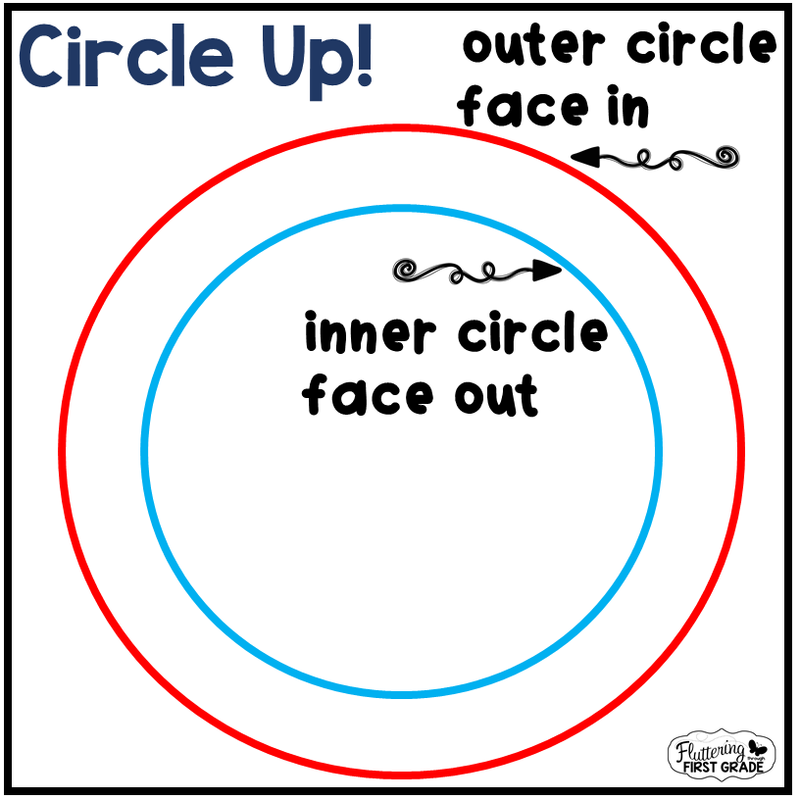 One way I like to explain this is with my morning work routine. In my room we complete Morning Wake-Up at the beginning of each day. I allot and 30 minute time slot for this routine. Sometimes it takes less, sometimes a little more. But, on average this routine that some teachers spend 5-10 minutes on in their classrooms gets a lot of attention in our room. 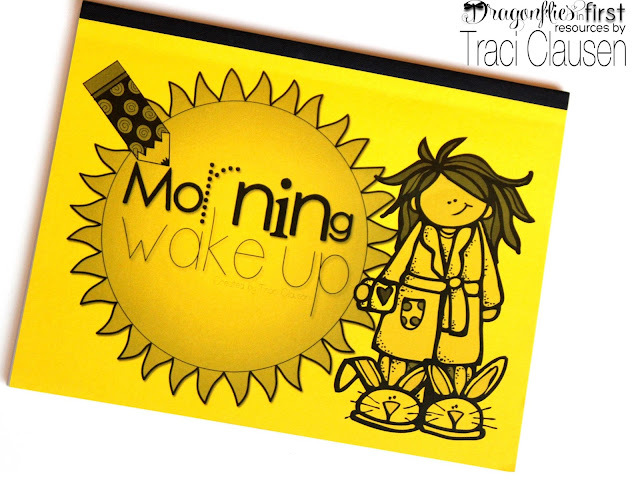 Morning Wake Up is a review sheet that we do each day. I've had it bound into books that the kids keep in their desks. 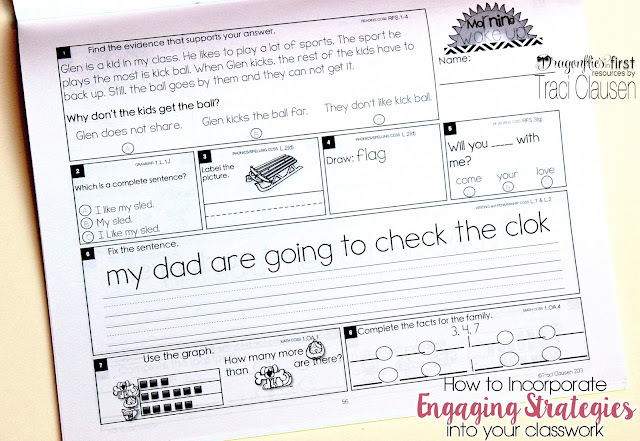 For the most part the kids can complete all of the aspects of each page on their own because it is review. However it remains a little bit challenging so they are not completely bored. 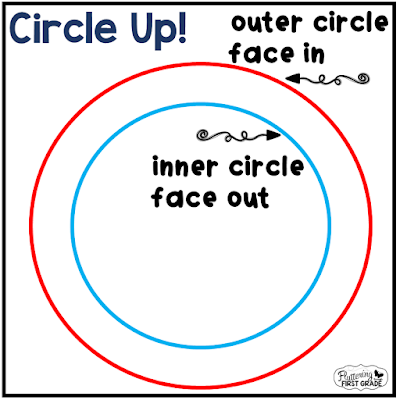 The pages are routine, so there isn't a lot of teaching involved, they are allowed to confer with table mates and partners if they aren't sure (the "how to" on group and partner discussion is practiced at length in class so they understand the expectation and procedure). 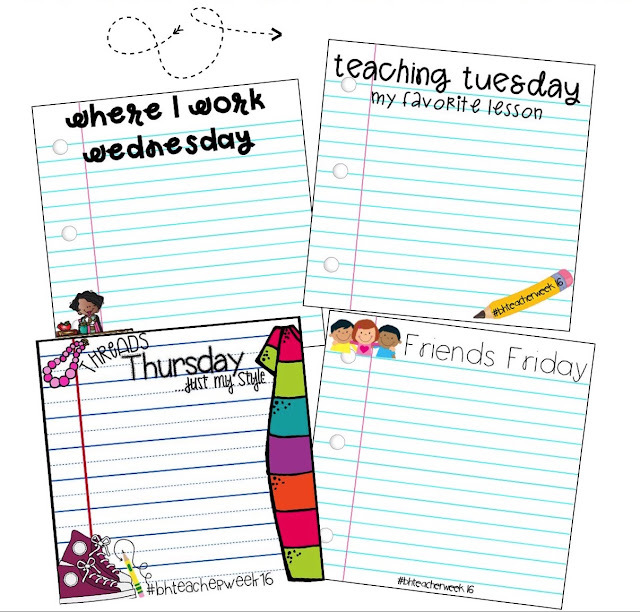 I have mine bound into a book for each student just to keep things quick and handy. Here's one of the pages. 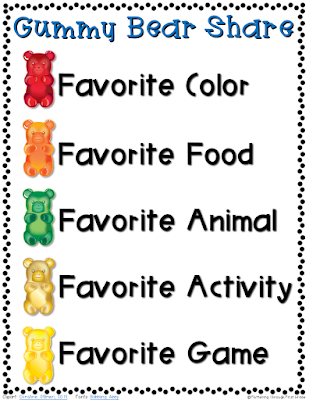 Keep in mind that the question content/standards vary a bit throughout the year, but the format is always similar. 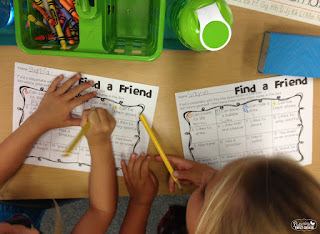 On most classwork I instruct the kiddos to work on their own, or with partners/small groups (we've discussed HOW to work together numerous times - so there are discussions - not just one kiddo telling the other kiddo(s) the answers.) For our morning work, the routine is always the same. The know exactly what to do each day so little, if any, instruction is needed. A finished page would look something like this. "Ok kiddos, let's go over this." And they grab their red pens. But this is the important part. I don't just tell them the answers and have them mark them right and fix any errors. Each and every day we do a little lesson on each question. I consider it a time where they teach me. Their job is to explain to me why their answer is correct and I do a lot of asking why. A LOT OF ASKING WHY. This type of "going over" things is super important with worksheets. 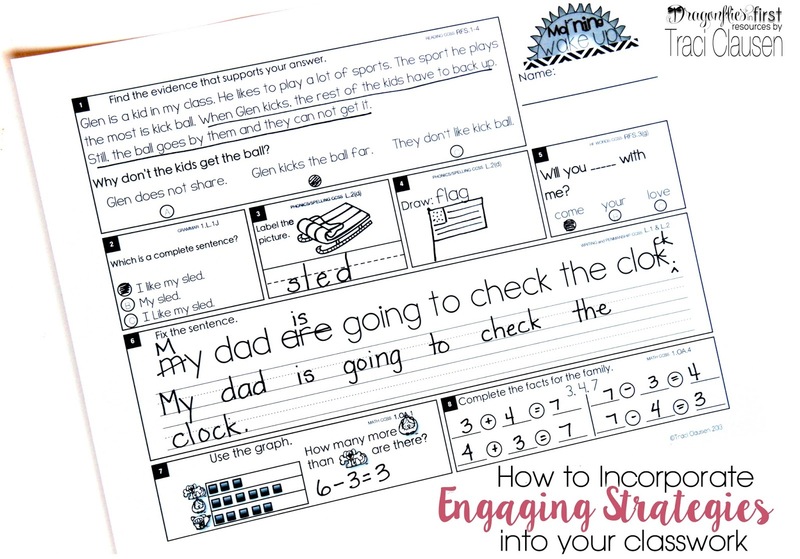 It ensures that your students are engaged in their learning, understand their answer choices and can do some reciprocal teaching which is another extremely important engagement strategy. The first question is my favorite part. This is really hard first graders. Quite honestly, most of the time it requires some common sense that a few of them haven't quite developed yet. This type of "read the paragraph and answer the question" format is found on many worksheets... my procedure in grading/going over/discussing it is nearly always the same. 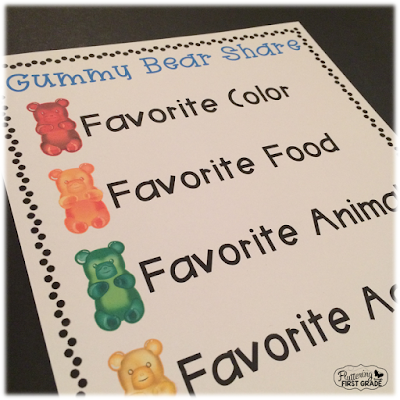 Is it possible that a kid may not share? Sure, we've all met kiddos on that playground that have difficulty with that. Might the kid not like to play kickball? Absolutely, it never said that the kids liked to play it. We really don't know how they feel. Could kicking a ball far keep other kids from catching it? Yes, it could go way over their heads or go by them too quickly. Ok... so were there any clues to make one answer a BETTER choice than the rest? The point here is that often times there will be more than one possible choice. 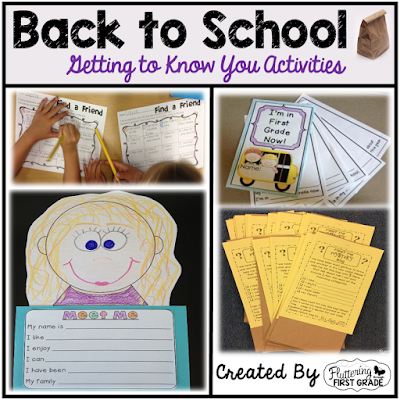 I encourage the kiddos to search out evidence that will help support the BEST choice. They must give me the reason WHY they chose choice B. This is a great technique to use whenever going over short reads and answers. Simply stating the answer isn't enough. You can take any work similar to this so much farther. A lengthy, meaningful lesson can be made from one small paragraph. 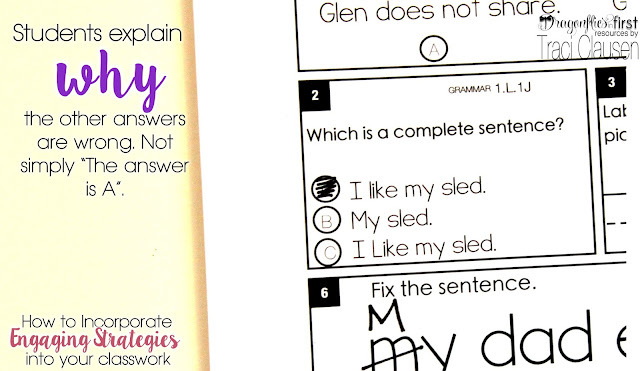 Have students underline evidence for their answers whenever they are completing worksheets - it doesn't matter if that task is in the written directions or not. For direct questions like this consider asking: "Why isn't C the correct answer?" Or, "What's wrong with B? It starts with a capital." Having kiddos explain why something is wrong allows them to engage higher level thinking and demonstrate a more thorough knowledge of a concept. When they CAN'T explain it - I know we have another opportunity for a well needed lesson. This type of question allows us to discuss WHY the name of this picture follows a phonic or spelling rule we've learned about. 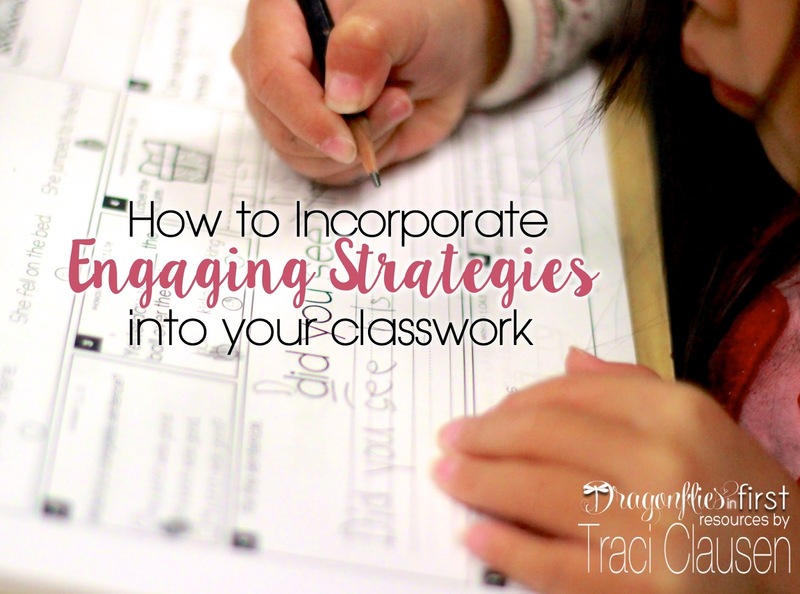 Find opportunities to incorporate what you've been discussing in all of your classwork. Those phonic rules are all around us. Pointing them out constantly helps students associate real world to their learning. Another important engagement strategy is drawing or illustrating. Incorporate this skill whenever space allows. The directions to "draw" something don't need to be written on the page. 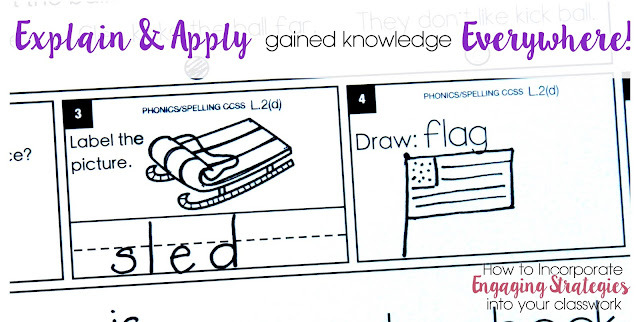 In fact, the back side of a worksheet often offers plenty of opportunity to take learning farther by asking students to illustrate words, main ideas, essential facts and so much more! I LOVE to have them explain to me the phonic rule or spelling pattern found in words, rather than ask them to spell or read it correctly. AGAIN... the more they can explain, the higher level their thinking and the greater rules are embedded into their schema. Reminding students to read ALL answer choices in questions whether or not they think they know the right answer right away is an important skill and allows for more practice and engagement. In "grading" or going over questions like the one shown below, take it further than simply saying "The answer is A" or "What is the answer?". "What is that mark at the end of that sentence? What does it mean?" "Both a and c end in e. Why doesn't the o in those words make the long o sound?" "What would they say if the DID follow the rules?" This provides the kiddos with another opportunity to demonstrate their knowledge on sight and high frequency words who "do not follow the rules". 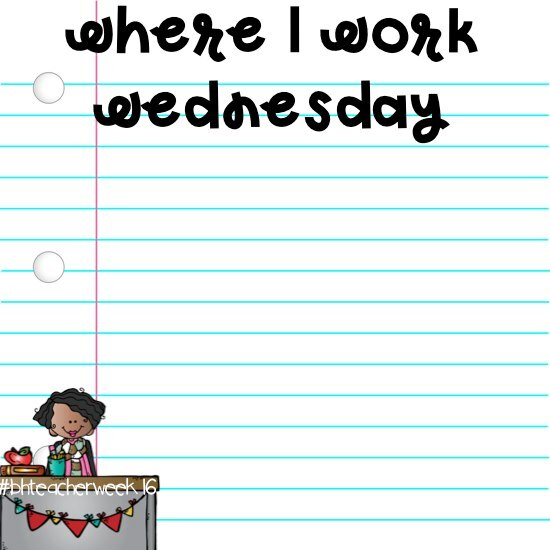 Place emphasis on letter formation, editing, grammar, and sentence construction on all things. Don't just save it for your writing block. Consistently being attentive to sentence structure and all that goes into writing will help further develop those skills. 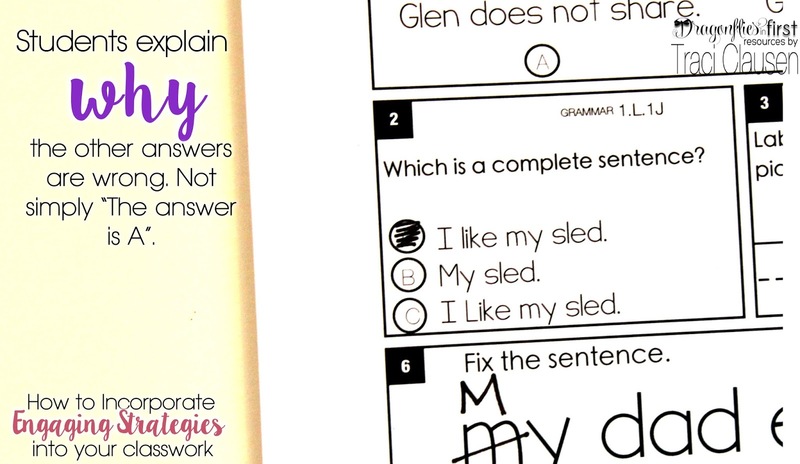 Just "fixing a sentence" on a fix-a-sentence activity isn't always engaging enough. Incorporate as many skills as possible. "Is there another way we could word this sentence?" "What adjective or vivid word could you add to make the sentence more interesting?" 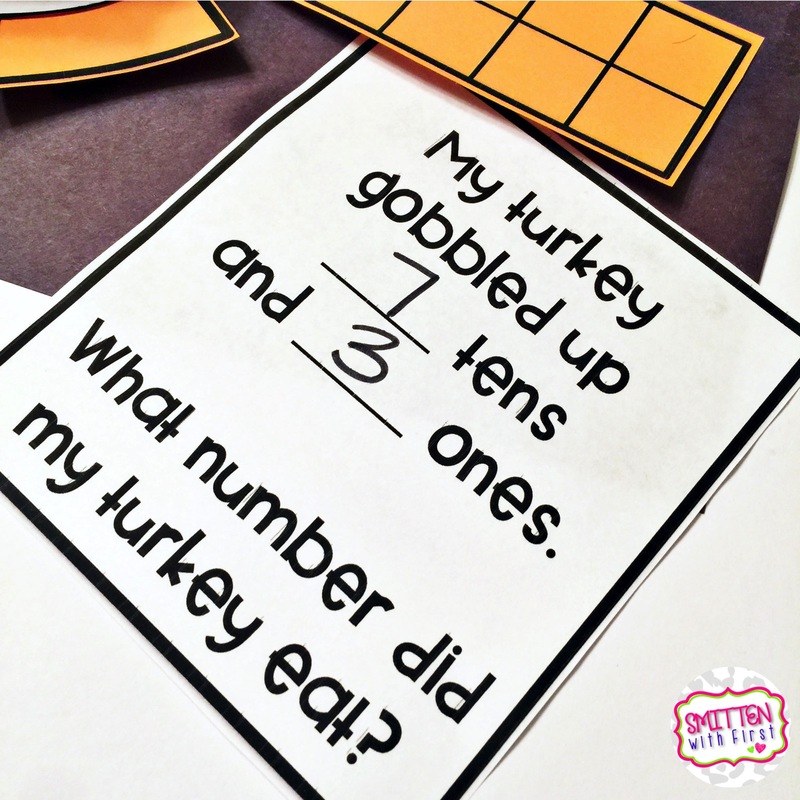 Ask your kiddos to show complete number sentences for how they found their answers instead of simply writing a number or bubbling in an answer. For example on problem number 7, it would not be acceptable to only write 3. Whenever possible, have students explain their answers in a written sentence or two, draw a picture to illustrate the process or teach a friend how the equation is solved. Throughout the time we are "going over" our papers I walk around the classroom and monitor their happy marks (stars, hearts, happy faces... whatever they can draw quickly). To be honest it only takes 1 or 2 times of someone in class getting their paper thrown in the trash for "cheating and not correcting their paper the right way" along with moving their tile to ensure that the whole class does the right thing and stays focused on the important part... LEARNING. I emphasize over and over again that we all learn from our mistakes and explaining our thinking. When I first started teaching, it was hard for me to see taking this much time on "grading" as anything other than a COLOSSAL WASTE OF TIME. After all, it's review, it should go quick. But I realized that this review was a perfect opportunity for the kiddos to completely consume these concepts. Eat them up, spit them back out, know them upside down, sideways and backwards. AND it helps me identify who knows the concept and who doesn't while allowing me to immediately address the issue. Realizing I had to make a shift in thinking in order to ensure what we did in class was as meaningful and effective as could be definitely made me a better teacher and definitely helped my students become amazingly successful thinkers! If you feel that stress of getting through it all, I greatly recommend you try telling yourself to slow down and just spend a day doing a lot of asking why. Cut back on the worksheets, and make sure the ones you do use are valuable, engaging and provide thinking opportunities. Have your kiddos teach you and each other what they know. You will learn a lot about what they don't know and what you thought they "got" but really didn't. If you are nervous about slowing down and letting some things on the plan go - I promise you'll change your mind after shifting gears for a couple of days. Once you see the shift within your student's knowledge gain you will be so happy you took the time. 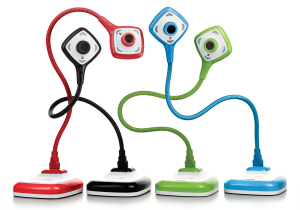 Worried your higher level students will be bored? Don't be. They absolutely LOVE being able to teach a concept back to you. All of my kiddos are seriously incredibly engaged during these "grading" times.